Pennsylvania passed Act 16 in April 2016 and medical marijuana dispensaries officially opened their doors in February of 2018. As the program begins its expansion with new products and Grower/Processors, it is understandable to have confusion with various cannabis terminology. 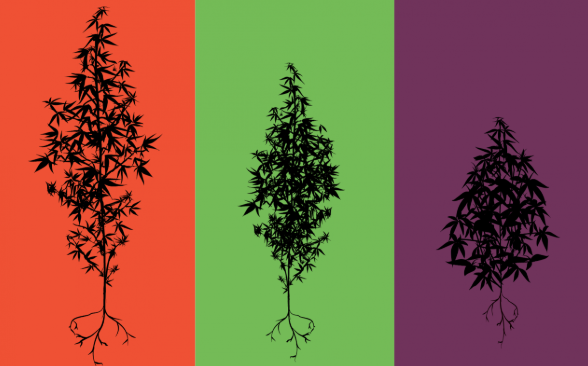 It is important to understand that each strain is genetically different from one another and will yield unique cannabinoid and terpene profiles; meaning that two indica strains most likely will produce varying effects. Additionally, each person and their endocannabinoid system is unique and bound to have a distinct response to cannabis use. Cannabis plants can be divided into two categories: Sativa and Indica. Sativa plants are known to be extremely pungent smelling, with aromas ranging from sweet and fruity, to earthy with undertones of diesel. Popular strains like Island Sweet Skunk or Sour Joker can be sweet and tropical, whereas strains such as Diesel can be earthy and diesel-y. Although these strains can provide similar effects, the distinction really lies in the smell, formally known as their “terpene profile”. Sativa strains are known to produce an uplifting and cerebral euphoria that can be energizing and stimulating. These strains can significantly increase creativity, which made it a popular choice amongst many philosophers, artists, and musicians. Sativas are often recommended for patients looking to medicate in the morning or during the day, keeping you energized and and uplifted, ready to take on the day. Indica strains carry a variety of aroma profiles such as: pine, pungent skunk, earth, hash, sweet, fruity. The effects produced by Indica strains can be very relaxing, typically providing a full-body muscle and tension relief, with lighter cerebral effects in comparison to sativa strains. Indica strains can be ideal for relieving tension and anxiety after work or at the end of the day. Often patients dealing with anxiety, insomnia, muscle spasms and tension, chronic pain, and menstrual cramps benefit from indica strains. Individuals who suffer from various diseases such as Multiple Sclerosis, Parkinson’s Disease, fibromyalgia, lupus, sleep apnea, and insomnia may also benefit from the effects of Cannabis Indica. Traditionally, cannabis users attributed strain potency and medical effects to high levels of the cannabinoid Tetrahydrocannabinol (THC), which has led to aspiring to grow plant and lineages that are full of THC. THC may be the most prevalent active compound in marijuana, but it is only one of many cannabinoids that we are just learning more information about. Due to popularity and recent numerous studies that have been done with cannabis, CBD is beginning to emerge as popular new buzz word. Cannabidiol (CBD), is the second most prevalent active compound in cannabis following THC. Recent studies have shown CBD to produce a multitude of medical benefits: anti-inflammatory, analgesic, anti-seizure, anti-anxiety properties without the psychoactive effects that THC provides. CBD may additionally counter the psychoactive effects of THC. Levels greater than 20% are considered high THC strains, whereas CBD levels greater than 4% are considered to be high. Research is promising for conditions that are difficult to treat such as Crohn’s Disease, PTSD, MS and Epilepsy (specifically Dravet’s Syndrome).